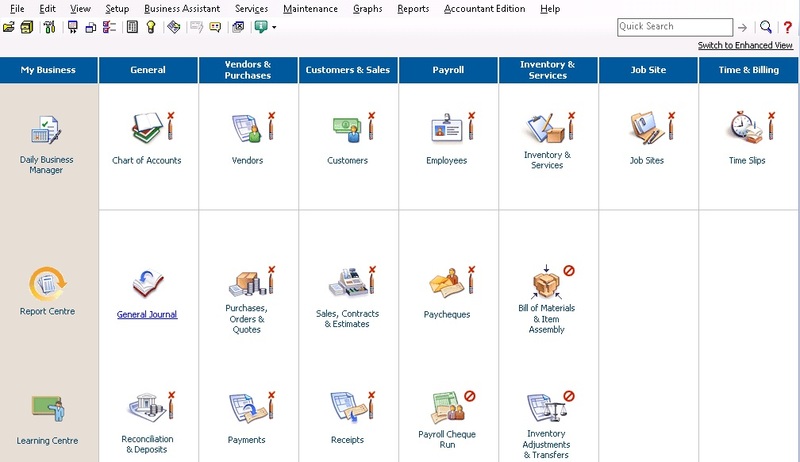 Sage 50 CA Support and Insights What is an accountant’s copy? Is it the same as a backup file? What is an accountant’s copy? Is it the same as a backup file? The only common attribute of an accountant’s copy and a backup file is the file extension, which is *.cab for both. But they have different functions. A backup file is a "security copy" of the database that can be used in case of issues on the original file. Or it can be used to transfer the company database from one computer to the other. So when a backup file is restored we have exactly the same database (with the same transaction) as before the backup was made. 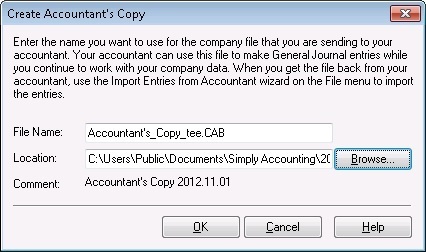 The accountant’s copy allows a user to send the database to someone who has a special version: Accountant’s Edition. 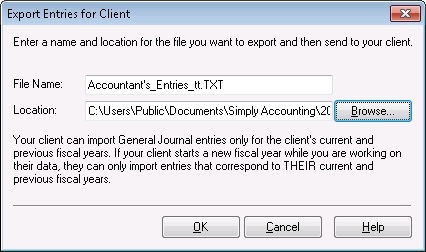 When the accountant’s copy is opened, the accountant can only post General Journal entries and consult transactions reports. So the accountant’s copy has limited features that allow the accountant to review transactions, journal entries and make corrections if needed. After posting journal entries, the accountant can return the file so that they can be incorporated to the original database file that was being used. That is the main function of the accountant’s copy. Please make sure you read the above message carefully. You can now send the accountant’s copy to your accountant who should have the Accountant’s Edition of the program. Only that version and your program can open an accountant’s copy created on your computer. To restore an accountant’s copy using an Accountant’s Edition, you can follow instructions on how to restore. There is a visual difference between a restored backup file and an accountant’s copy. You can see that in the Classic view on the program. Once the accountant opens the accountant’s copy there is a pencil with a red cross beside all modules but the General Journal. When a normal backup file is restored there will be no pencil with a red cross beside modules. That means all modules can be modified. But it is not possible to import or incorporate changes made to a restored backup file into the original database. As mentioned earlier that is possible for an accountant’s copy. The program will give a summary of the importation in the end. You should then be able to continue your normal business activity. Please do not hesitate to ask questions or give your comments regarding the above steps. 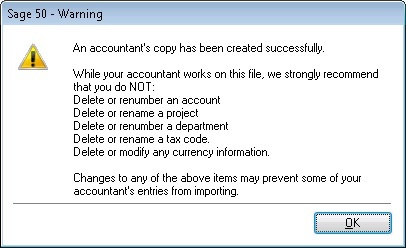 Can you add accounts in an Accountant's Copy?